Recently, this Bushwick Daily tipster saw something tremendously exciting a few blocks from home: one of our all-time favorite street vendors, Tamale Lady is back with her signature tamales and arroz con leche after she was off the sidewalks for the past three seasons. Her chicken tamales have a hint of mild green chili while her cheese tamales feature a slightly hotter red chili, and while neither are vegetarian, both are gluten-free and delicious (seems like she tends to run out of chicken first). The Arroz con Leche she sells is delicious, too – the super-sweet hot condensed milk is dotted with pieces of cinnamon bark and about a quarter of each cup is filled with rice that’s absorbed the flavors, and that may require a spoon to finish. Tamales and arroz con leche cost $1.25 each – five quarters for one thing, or $2.50 for both hot food and a hot drink (which is less than the price of a cup of pourover coffee in Williamsburg). She’ll also supply you with napkins and a plastic fork for your tamale. So where is this amazing Tamale Lady, you wonder, and when she is there?! The answer is, we can’t tell you. Sorry, dudes. We know you’d be there in a heartbeat, but before we ran the piece, we found ourselves harboring reservations because of the thorny politics of street vending in NYC. We made a phone call over to the Street Vendor Project (SVP), who confirmed our suspicions that the hype may not be good for our friend. 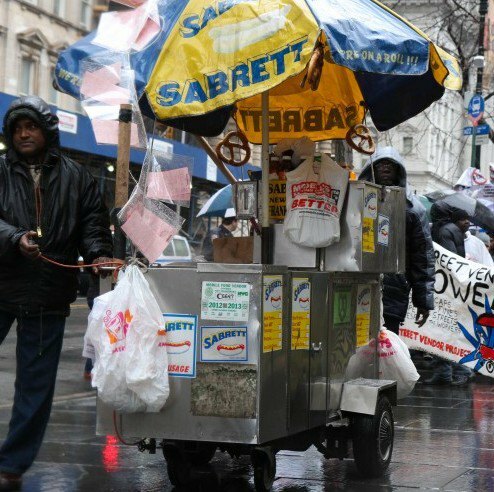 The SVP estimates that there may be as many as 20,000 street vendors currently working in NYC, but the NYC Business Solutions website tells us that they only issue about 5,000 food vendor permits a year – there’s a long waiting list for getting issued a license, and an intense application process one has to go through before becoming eligible for the permit. As such, we’re assuming that it’s possible that our Tamale Lady’s relatively small-scale operation may not have made the official city agency cut – and the Street Vendor Project reminds us that it’s hard to know when or where the Department of Health will end up checking in on someone selling food on the street (apparently even roving kids selling bottles of water can technically be considered unlicensed food vendors, oof). So, no name, no exact location, no schedule here. But keep an eye out for the Tamale Lady – and tip big when she gives you something amazing to eat. Then when Anthony Bourdain does a spot with her, you can say you knew her back when. Do you have a fave local street vendor we should patronize when we chance upon him or her? Delicious shrimp empanadas, perhaps, or vegan sandwiches to die for? tell us about it in the comments below, or email emilieATbuswickdailyDOTcom. Bon appétit!